Tirana is one of those cities that gives you a very special feeling. Tirana is Albania’s bustling capital with plenty to do but there’s just something about the city. There’s a sense that you’ve really discovered somewhere unexplored by most. Perhaps it’s because when it comes international travelers on the European travel circuit, Albania is on the road less traveled. However, Albania is Europe’s 25th most visited country with some 3.8 million visitors per year. For comparison, Albania’s neighboring country Montenegro saw around 1.8 million visitors in 2017 and is the 36th most visited country in Europe. To give even more insight there are 50 countries in Europe with the top visited being France at roughly 84 million visitors per year. A key difference between tourists in France and Albania is that there are very few transcontinental tourists in Albania – the majority of visitors are from neighboring countries. So why exactly is Albania on the road less traveled? The obvious answer is of course it’s lacking the infrastructure. Taking buses in and out can be a little confusing to figure out and rougher roads mean a longer travel time. Less flights in and out of an airport usually mean they’re more expensive. Albania is of course trying to boost it’s infrastructure but these things take time and it just saw the end of communism in 1992 – year(s) later than the countries neighboring it. The structure originally opened as an Enver Hoxha Museum and said to be the most expensive structure in Albania at the time of it’s construction. With the fall of communism came the closing of this structure as a museum. It’s worn several hats since then functioning as a conference center, exhibition venue, and even a NATO base before becoming all but abandoned. Currently it stands to be potentially demolished. Rinia Park is located in the center of Tirana and translates to “Youth Park”. It was built in 1950 as part of a major urban development program. At the end of communism in 1991 the park became a hangout for the kingpins of Tirana’s underworld with illegal establishments popping up around it. The city sought to clean things up around year 2000 and demolished 100’s of the buildings housing these establishments. Now you can stroll through the park enjoying the sites of such monuments as the “I Love Tirana” sign and the Independence monument. Postblloku (Checkpoint) is a collection of monuments to commemorate the Albania’s political prisoners who suffered under the Enver Hoxha regime. It consists of three main elements: concrete supports from the Spac Labor camp, a piece of the Berlin Wall, and a concrete defensive bunker. Inside the park you’ll find a zoo, botanical garden, artificial lake, and memorials to many Albanian personalities. At 230 hectares you could definitely spend an entire day exploring the park. As you walk around the city be sure to pay attention to all the buildings, electrical boxes, and street signs so that you don’t miss any of the great street art. As you can see in the photo above, I managed to find what some may say is a portrait of me. Next in the gallery is the “if you pee in public, it will be put on Youtube” sign made famous via reaching the top post on Reddit. It seems that cable cars are popping up in capital cities all over the world to take you up for an amazing cityscape view. Tirana is no exception here. 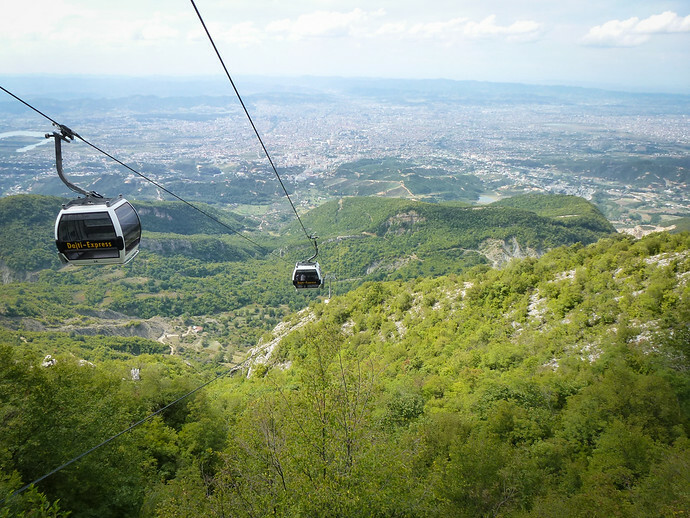 You can follow FoxNomad’s How To Get To The Top Of Tirana, Albania’s Mount Dajti By Cable Car if you’re keen on making the venture. Here’s a link to the official page in case you want to confirm their hours or ask a question: Dajti Express. I have this deep love of markets and fresh produce. Maybe it’s because in the U.S. farmer’s markets are sort of this “pinky up” affair. In most other countries these markets are where locals go for the best deals on fresh fruits, veggies, and other things straight from the source. Pazari I Ri in Tirana has undergone recent renovations so the atmosphere is quite nice with lots of cafes and restaurants surrounding it. You can click the link above to see where it is on Google Maps. I highly recommend this cafe for the ambiance, decor, and history that lives inside it. As the name implies, it’s meant to be a cafe and museum at the same time. The interior is meant to resemble the inside of an Albanian home during the communism era. There are all sorts of interesting tidbits to admire as you sip your coffee. While Veggies isn’t entirely vegan, it’s a vegetarian restaurants that’s vegan friendly and was one of my favorite place I ate at in Tirana. An honorable mention goes out to City Art Cafe that I stumbled up while walking around and had a great vegan burger. 9. Learn about Albania’s history at Bunk’Art. I must admit that I’m not generally one to visit a ton of museums but Bunk’Art 1 & 2 are two experiences that shouldn’t be missed when visiting Tirana. The museum’s are both located inside of old military bunkers that used to house Albania’s communist elite. They’ll take you on a journey through Italian invasion and a morbid communist rule up to modern day. It was an amazing way to learn about so much of Albania’s history. There are also some modern art pieces displayed within the museum. Next Post Pardon My Appearance!